quantitative MSI), their impact on endogenous molecules of the skin tissue (small endogenous metabolites, lipids, peptides or proteins) and their potential adverse effects (inflammatory or toxicity response). Skin is a highly complex organ made of several layers (stratum corneum, epidermis, dermis, hypodermis…) with specific properties and functions. In addition, there are different types of glands (sebaceous, sweat…), the dermal papillae, the sweat pores, the sensory nerves, the blood vessels; the follicle ducts, etc…. The skin acts as a barrier protecting from its environment and is the first line of defense of the human body. As a living organ, the skin could be affected by various disorders such as, psoriasis, rosacea onychomycosis atopic, Dandruff and Sseborrheic Ddermatitis (D/SD), acne or skin senescence… The knowing of specific biomarkers of each pathology gives access to an early diagnosis of diseases while the efficacy, toxicity or inflammatory markers permits to evaluate the action of dermatological drugs. For example, in D/SD disease, the up-regulation of cytokine (especially interleukins) levels in diseased skin provides an early indication of disease proliferation, as well as histamine, which acts as inflammatory biomarkers in this pathology. The down-regulation of ceramides represents, meanwhile, an alteration of the skin barrier integrity and consequently is an important proof of disease evolution. Molecular data on drugs and skin’ biomarkers are generally obtained by Liquid chromatography coupled with mass spectrometry (molecular profile of skin homogenate) or using Raman spectroscopy (depth profiling experiment). MSI combines the main advantages of these two techniques. 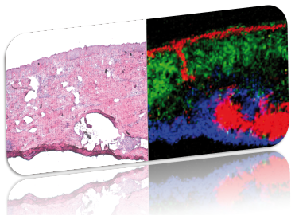 MSI generates two dimensional virtual images of a sample, a tissue section corresponding to a specific signal on generated mass spectra i.e. a specific molecule from the tissue. MSI and more specifically MALDI Imaging is used to obtain a global view of the molecular composition of the skin and of its different substructures. Another advantage of MSI is to analyze the skin at high spatial resolution. The laser beam diameter can reach 20 μm and allows having access to small histological structures of the skin. In order to evaluate the action of dermatological drugs related to these pathologies, MSI provides the precise localization and profiling of these exogenous molecules after a topical administration. MSI helps to understand their efficacy and pharmacokinetics (PK)/pharmacodynamics (PD) by following specific endogenous biomarkers. MSI was already used to study the distribution of endogenous species  in skin such as cholesterol  or proteins such as decorin, especially lipids  for example, glycosphingolipids (globotriasylceramide and the galabiosylceramide) involved in mechanism . Furthermore, it was also used to follow penetration of exogenous compounds in the skin  such as the anti-inflammatory ketoconazole . Vaccines can also be studied using MSI to evaluate the response of the skin itself to the treatment by or toxicity biomarkers and estimate changes in endogenous metabolites levels. Several examples of endogenous and analysis in skin substructures will be illustrated in the following paragraph. MSI was used in order to follow biochemical micrometer level and to support the understanding of PK/PD and potential toxicity. section according to ImaBiotech’s SOP to observe dermal layers and correlate with MS imaging data. detection of potential necrosis or apoptosis biomarker, carnitine in skin substructures. is related to the study of the distribution of a class of compounds widely present in the skin, the lipids. Some of the lipids can act as inflammatory markers for the skin . For example, Eicosanoids are a large class of signaling molecules that includes prostaglandins (PGs), thromboxanes, leukotrienes, hydroxy fatty acids or lipoxins. These lipids are easily detected using MSI and can be localized in skin substructures. The figure 2 shows the distribution of different lipids from specific classes; sphingomyelin (SM (34:1), [M+K]+, m/z 741.48); phosphatydilcholine (PC (34:1), [M+K]+, m/z 782.66) and triacylglycerol (TG (54:3), [M+K]+, m/z 907.77). Each of these ions has a specific distribution in the tissue and allows the differentiation of the skin substructures (Epidermis, dermis and hypodermis). The epidermis shows higher intensity signal for sphingomyelin, whereas triacylglycerol is more intense in the hypodermis. The overlay distribution of these three lipids gives a nice picture closely related to the skin histology. 3. Two mass spectra corresponding to specific locations in the dermis and the epidermis are shown. From these mass spectra we can identify several lipids using lipid database search and can separate them in different classes (sphingolipids, glycerophospholipids, glycerolipids, sterol lipids, phenol lipids). We found that almost low molecular mass lipids are concentrated into the epidermis whereas there are higher molecular mass lipids in the dermis; this is the case of sphingolipids, major constituents of the outer layer of the skin. observed at the level of the epidermis. Ceramides are associated with permeability barrier function of the skin and concentrated especially at the level of the stratum corneum. These lipids are important for cosmetology or dermatology because they are modulated in some skin disorders, such as eczema or psoriasis. Thanks to MSI we have observed the fine localization of these different lipids in the skin. It is also possible to evaluate the inflammatory response or other disease state in both the dermal and the epidermal layers. The third application of MSI in skin analysis is related to the study of skin penetration of pharmaceutical compounds after topical administration. In this example, a mixed solution of three drugs was applied on human skin and after 24 hours punch biopsies were obtained. The figure 4.a displays the mapping of the three compound penetrations through skin layers at a spatial resolution of 50 μm. These molecular images highlight the different behavior of each drug after topical administration. In fact, compounds 1 & 3 are somewhat similar in their localization but with more intensity for the compound 1 in the dermis and hypodermis. However, the compound 2 appears to be even more concentrated in the dermis with no penetration in the hypodermis. The graphic of figure 4.b is a schematic representation of the variation of the signal of each drug through dermal layers; it permits to assess easily the specific penetration of each compound. This example shows the ability of MSI to obtain a quick assessment of drug penetration in the skin substructures. These examples of applications illustrate the potential of MSI in skin tissue analysis. MSI has the unique ability to generate both molecular and spatial information during a single experiment. It provides a global approach: provides information not only on drug skin penetration, but also provides information on potential impact on toxicity (necrosis or apoptosis) using biomarkers such as carnitine, or inflammatory biomarkers such as eicosanoids, or other disease state biomarkers (endogenous metabolites, lipids, peptides or proteins).